The XRS 9965 provides total protection and peace of mind with Super-Xtreme Range Superheterodyne Technology, detecting all 15 radar/laser bands with its super-fast lock-on detection circuitry. 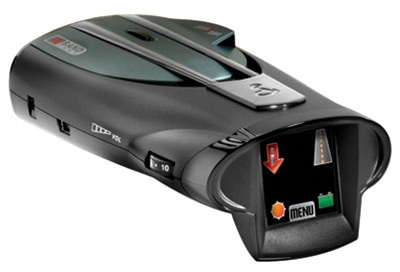 The unit provides extra detection range and the best possible advance warning to even the fastest of POP mode radar guns Other features include Cobra exclusive Touchscreen, full-color ExtremeBright DataGrafix Display, an 8-point electronic compass, Voice Alert, car battery voltage display/low car battery warning and much more. With the optional GPS Locator (Sold Separately) and AURA Database, upgrade your unit to alert you to verified Speed and Red Light Camera locations, dangerous intersections, and reported Speed Trap locations for entire United States and Canada (purchase and subscription necessary). Cobra XRS-9965 is the same as the higher priced Cobra XRS-9970G but the 9970G is bundled with the optional GPS unit. 15-Band Detection - Detects 7 radar, 6 laser and 2 safety signals. Radar signals include X Band, K Band, Ka Superwide, Ku Band, VG-2, Spectre I and Spectre IV+. Laser signals include LTI 20-20, Ultra Lyte, ProLaser, ProLaser III, Stalker LIDAR and Speedlaser. Safety signals include Safety Alert and Strobe Alert. AURA Camera & Driving Database (w/Optional GPS Locator)- GPS-based technology warns the driver of fixed speed and red light cameras, speed traps and dangerous intersections across North America. The AURA database is updated daily and provides the industry's most complete and accurate coverage and reliability. GPS Locator and Lifetime subscription included. IntelliScope (w/Optional GPS Locator) - This Patent-Pending Technology provides information about the direction of Location Based Alerts relative to your moving vehicle using Global Positioning System. Programmable Up to 1,000 Location Alerts(w/Optional GPS Locator) - Add up to 1,000 location-based alerts of your choice. Safety Alert - Warns drivers of the presence and/or approaching emergency vehicles, railroad crossing, and road hazard locations equipped with Cobra's exclusive Safety AlertÂ® transmitters. Digital Speedometer (w/Optional GPS Locator) - Provides accurate, current vehicle speed using Global Positioning System. Latitude/Longitude Information (w/Optional GPS Locator)- Provides accurate latitude/longitude information using Global Positioning System. 8-Point GPS Compass (w/Optional GPS Locator) - Provides accurate, 8-point directional reading using Global Positioning System. This "detector" does everything but detect well. Radar/emergency vehicles range is 100-300 yards or less (have been using for about a year). My eyes work better. Best does have the best price by far and free shipping, so I'm getting a Passport 8500x50 from them. Lesson learned: always read unbiased reviews first! Best gets 5-Stars for price/shipping, Cobra gets 2-Star for making a product with bad performance. It was a present and my husband really likes it!